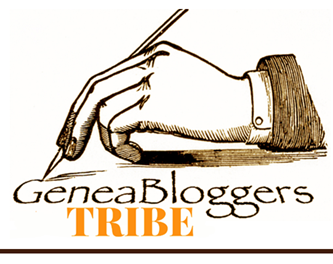 Tonight I had a glitch with GeniAus’s Hangout on Air for which the topic was an enquiry from Sharon from Gathering Dust blog re how we each handle our filing/”piling” system. Perhaps the gods were laughing,as after the first minutes I was inaudible to anyone and my screen dump didn’t work. In the end I left to hangout with living family members who dropped by unexpectedly. However I think Sharon’s enquiry has a lot of merit and fits with my aspirations to get back to basics. I am much more confident of my old-style filing system which lets me readily (mostly!) find documents, whereas my digital filing is more like Topsy – it just grewed. At this point it’s worth reiterating that I have been researching for nearly 30 years, long before the digital era hence a partial-explanation of the Topsy system. I have long had multiple A4 arch-lever folders categorised by family name, and sometimes by generation. Within each folder I have the documents sourced by topic eg church, land, civic, certificates, military. This means that I have only one “cluster” of information to peruse if I want to locate a document. Generally this involves minimal disruption and has worked well over many years. It also allows me to have folders for what have become my one place studies on Dorfprozelten and Clare. Dorfprozelten info is mostly filed by family as there is a limited number of them, while Clare is by topic. General research has its own tab/folder. The only problem with this system is the increasing number of bookcases, and filing, required. This is where I start to come to grief more often than with hard copies. 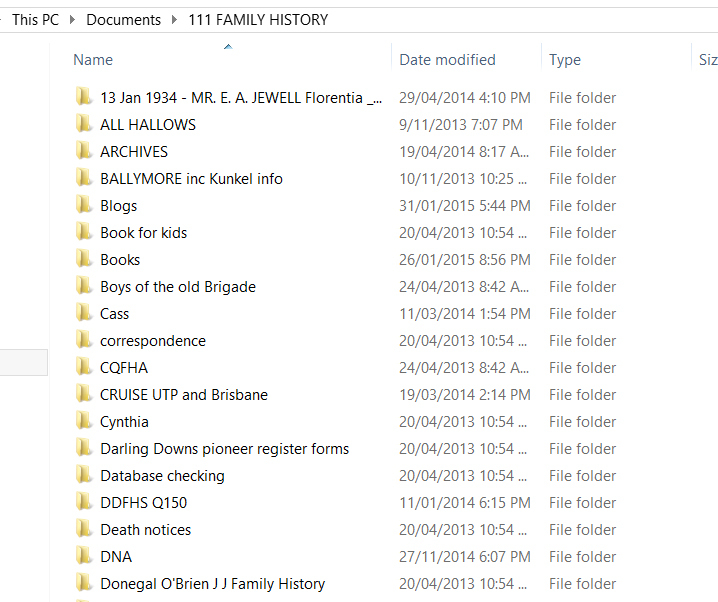 Once again I have all my families in one folder “111 Family History” which places it at the top of my file directories. 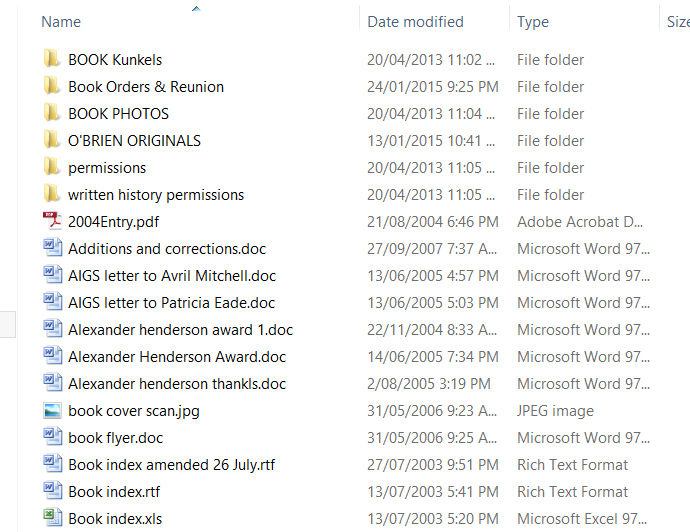 Within that folder I have sub-folders by surname and in particular cases, by place or research topic. If the information regarding place is specific to one family I file under that name. 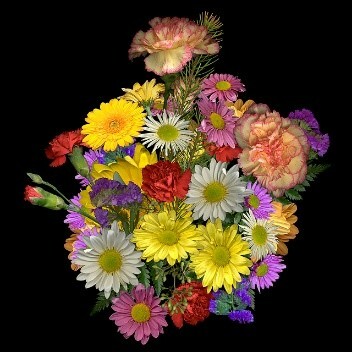 With women I file under married name, post-marriage, and by family of origin/maiden name prior to marriage. I haven’t been in the practice of naming the files consistently and this is one thing I want to remedy. I do use the surname, first name and content/source concept (again, generally rather than consistently). In the past I was in the habit of filing photographs, including those of documents in archives/libraries, under my Photographs folder by name/place etc. I don’t believe this is working any more and that I need to move research photos to the family history folder which relates. In this way I have them all “together”. Nor have I been good about adding metadata but have been slowly adding this over time and with more knowledge under my belt thanks to a RootsTech lab class, hopefully I’ll get better. I need to remember that slow and steady wins the race rather than hustle, bustle. This is where I can really get in a tangle. Even before I signed up to a One Place Study, I had been collecting all relevant names from whichever parish register/document I’d been looking at for my family. I’ve found it all too easy for this to get messy. 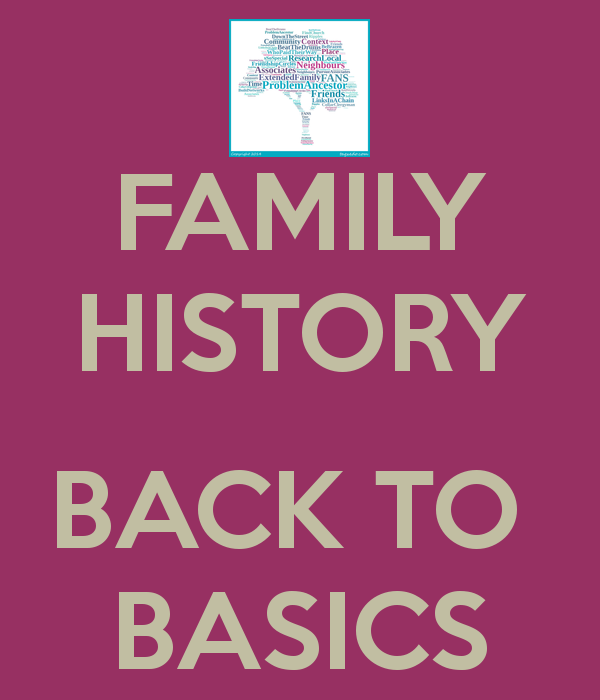 It’s also why I find genealogy programs restrictive but perhaps I need to have another go with an open mind. 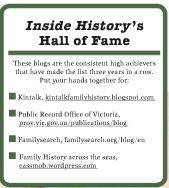 I’m presently exploring Family Historian, RootsMagic and Heredis as my long-time Aussie program, Relatively Yours, seems to be on the way out which is a great shame as it has always offered an innovative idea of family. In the past I’ve entered the OPS data into an Excel workbook which is saved under the family name, or the place, depending on which is relevant. This lets me sort the data into family clusters in a separate spreadsheet while maintaining the original in time sequence. I make a practice of entering surnames/family names in a separate column from first names which makes sorting more reliable and effective. I’ve been slack about consistent naming of files and I haven’t had an overall plan before launching into naming files. I’ve separated photos I’ve taken of documents from my other research documents on that family (in some/many cases). Quite honestly I have way too many photos of all types! My Downloads folder has become a default documents folder and needs a major spring clean and the relocation of sub-folders to their correct place. The filing keeps on piling up until it annoys the hell out of me and I have to clear the decks – often before I travel! I’ve kept my hard copy files according to a pretty coherent system. This applies in particular to my Kunkel family files because this is how I ordered them when writing my book. Within the Kunkel Book folder I have the family documents subdivided by the first generation. I have the photo folder following the same system. However, as you can see, I still have some wayward files. With my East Clare discoveries on Trove I’ve been more consistent with my file naming conventions, using SURNAME, First Name, article reference. This may be because I’ve been doing these more recently. If I source photos elsewhere I add a code which indicates the repository eg QSA, JOL, SLQ. 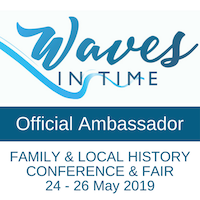 I did manage to keep my Kunkel research documents in a coherent fashion which made it possible to publish the family history and organise two reunions, for which I set up my own database. (some positivity is needed here!) However, even here you can see that some wayward files have escaped from their proper place. GeniAus has given us hope and affirmation that there’s no one right way to process our family history (though she was a bit harsh on the cat!). However with the deluge of digital information I can’t avoid the conclusion that the data is now the master and I’m the slave….I need to reverse that process if it’s not to drown me out. What is quite illogical is that I’ve actually got worse since I’ve retired and had more time available…go figure! I think Jill is absolutely spot-on when she says we have to choose a system which suits us – without that we will constantly self-sabotage. Without a doubt I need to SLOW DOWN, take time, and be consistent. Thanks to a tip in the Hangout from Alex of Family Tree Frog blog, I’ve been playing with a new program called Coggle which I find quite intuitive to use. 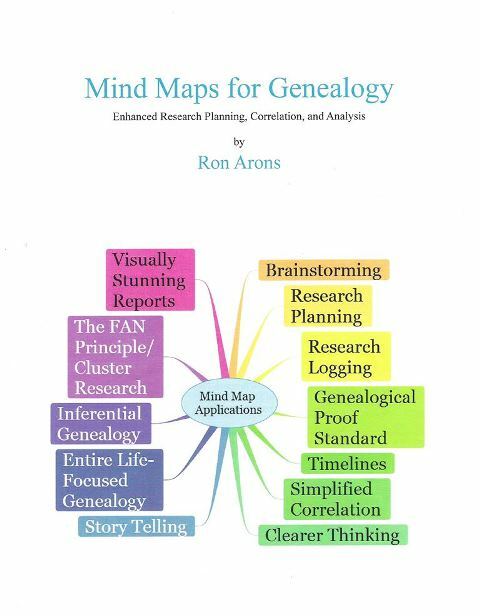 Her mention of this is timely as it fits with my long-term interest (but inaction), and the book I bought at RootsTech on Mindmapping for Genealogists. I’m playing with Coggle to mindmap how I’ve set out my Congress presentation on the marriage of family and local history. C’mon I’ve hung myself out to dry here….Do be brave and tell me: Am I alone in the schmozzle of filing/piling that I have? Are you totally organised and neatly systematic?